Being one of Queensland's better known freshwater destinations, Glenlyon Dam is a moderate sized lake of 1800 ha holding 254 000 ML of water at an average depth of 4.3m. It is also called Lake Glenlyon, Pike Creek Dam or Pike Creek Reservoir. there is an endemic population of Tandans (Eel-tailed catfish) and Spangled Perch. A Stocked Impoundment Permit (SIP) is required to fish here. There are fantastic facilities available at the Glenlyon Dam Tourist Park. Toilets, showers, Bar B Qs, drinking water, boat hire, public phones, tennis court and playground are available with the kiosk providing bait, tackle, ice, gas & petrol as well as food & drinks. 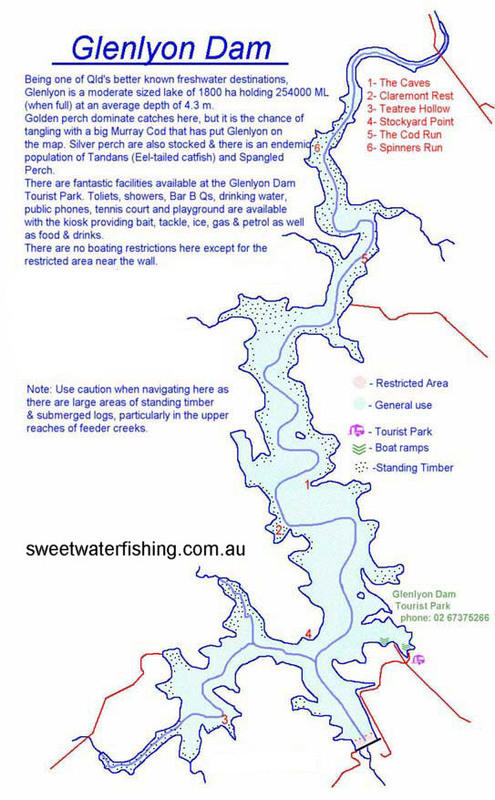 There are no boating restrictions here except for the restricted area near the dam wall. Note: Use caution when navigating here as there are large areas of standing timber & submerged logs, particularly in the upper reaches of feeder creeks.